The 1935 Duesenberg SSJ hammers for a price of $20 million, $22 million with fees. Photo by Mike Maez, copyright and courtesy of Gooding & Company. In recent years, there’s been considerable speculation on the future of the collector-car hobby, with many fearing that interest in prewar automobiles was on the decline. 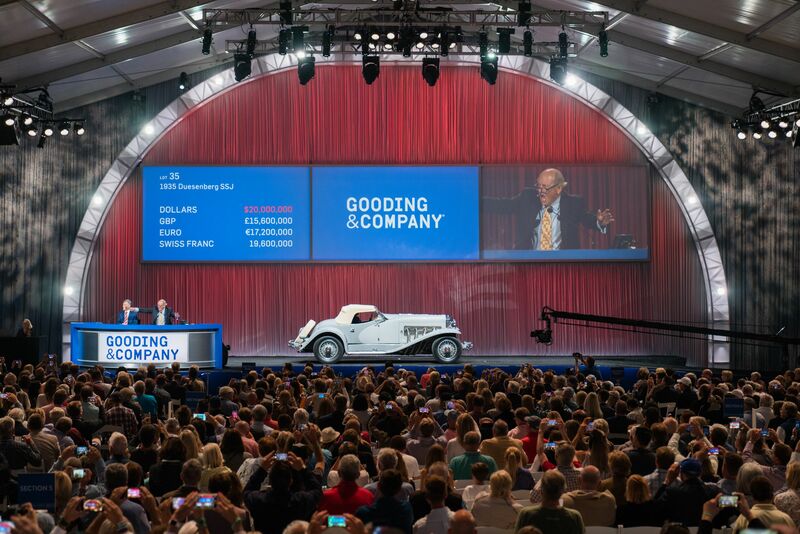 At the high end of the market, the recent Gooding & Company Pebble Beach sale would seem to indicate otherwise: Not only did a 1935 Duesenberg SSJ set the bar for a prewar automobile by selling for a fee-inclusive $22 million, but four other prewar models – from both sides of the Atlantic – topped the seven-figure mark during the two-day auction. The Duesenberg SSJ’s exceptional price can be attributed in part to its rarity. Just two of the short-wheelbase sports cars, powered by a supercharged straight-eight engine rated at 320 horsepower, were ever constructed, primarily to promote Duesenberg’s desirability. The record-setting example was originally owned by actor Gary Cooper, while the other SSJ was driven (though perhaps not owned) by Clark Gable. Driven and reviewed by Arch Brown for the August 1987 issue of Special Interest Autos, the record-setting SSJ had long been owned by racer-turned-automotive-entrepreneur Briggs Cunningham. When his Costa Mesa, California, museum shut its doors in December 1986, the bulk of the collection – including this SSJ – was purchased by Miles Collier. Part of the Collier Collection and The Revs Institute for the last 31 years, the Duesenberg was sold to raise money for Collier’s ongoing efforts to preserve automotive history and culture. Other prewar lots that topped the million-dollar mark included a 1931 Bugatti Type 51 Grand Prix, which sold for $3.74 million; a 1938 Bugatti Type 57C Atalante, which sold for $2.81 million; a 1930 Packard 734 speedster phaeton, which sold for $1.13 million; and a 1935 Auburn 851 SC boattail speedster, which sold for $1.01 million. Remaining lots in the top 10 included a 1958 Ferrari 250 GT Tour de France Berlinetta, which sold for $6.6 million; a 1955 Maserati A6GCS/53 Spider, which sold for $5.17 million; a 1955 Ferrari 500 Mondial Series II (“The Admiral’s Ferrari“), which sold for $5.01 million; a 2007 Porsche RS Spyder racing car, which sold for $4.51 million; a 1955 Porsche 550 Spyder, which sold for $4.46 million; a 1959 Porsche 718 RSK, which sold for $3.74 million; a 1967 Ferrari 330 GTC Speciale, which sold for $3.41 million; and a 2014 Ferrari La Ferrari, which sold for $3.08 million. Gooding & Company dropped the gavel on 123 of 147 lots offered, for an 84-percent sell-through rate. Total sales over two days reached $116.5 million, for an average of $947,175 per car sold. For compete results from their Pebble Beach sale, visit GoodingCo.com.